Jamie MacDonald admits that what many viewed as a blunder that helped hand Inverness Caley Thistle the Scottish Cup could be his last act for Falkirk. The 29-year-old parried a Marley Watkins shot into the path of James Vincent to score the winning goal. 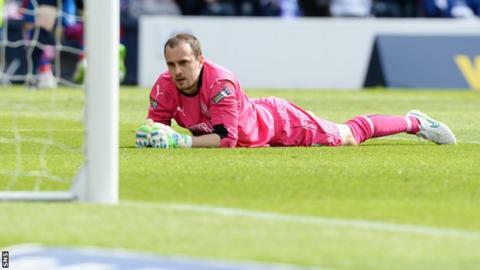 And now the goalkeeper must decide whether to extend his Bairns stay or accept one of his other offers. "My thoughts were - get the cup final out of the way then I will look at it, if I stay here or I move on," he said. "I'll deal with that on Monday or Tuesday." MacDonald told BBC Scotland that being lavished with praise for his role in the semi-final victory over Hibernian was little compensation for Saturday's 2-1 defeat. "I would much rather have been terrible in every round and walk away with a winners' medal than the runners-up," he said. "I'm totally gutted. The boys didn't deserve that and I have to hold my hands up and take a bit of responsibility for that. "He's obviously tried to put it into the back post and he's maybe not hit it as well as he could have, it's almost a slow ball, I've saved it, I felt I had it under control, my trailing hand's come over and knocked it wide and the boy Vincent's put it in." MacDonald was nevertheless delighted to have helped take the Bairns so close to lifting the Scottish Cup for the third time - their last success coming in 1957. "It is a great achievement for the club and all the boys and they can all be proud of themselves for how they played," he said. "It just wasn't our day, whereas the Hibs game we had a little bit of the rub of the green. "Congratulations to Inverness. They've had a great season and fair play to them." MacDonald thinks there is much potential in Peter Houston's young team. "When I came here at the beginning of the season, I knew it was a good young team," he said. "The standard's been a lot better than I thought it was going to be to be honest. "There are some fantastic young players here and, if they can keep that group together, you never know what the possibilities might be." Falkirk defender Peter Grant, who had cancelled out Watkins' opener to level the scores, absolved MacDonald of blame for the defeat. "The big man has been absolutely outstanding for us this season - he's kept us in games and he's won us games," he said. "It is one of those ones where he palms it out, but it could have gone anywhere and it just landed at the boy's feet. "We lost the goal as a team. It is not down to any individuals." "I have enjoyed every minute of it," he added. "Regardless of the result, it was the best day of my life to experience going into a cup final. "The losing feeling is horrible - it is the worst feeling ever - but it gives you an insight about that's what you want. "I want to win medals, I want to win titles. That's my ambition."